For years and years (and years and years), I've wanted to take a hand quilting class. I mean, yes, it's just sewing. Up and down and through and out. But I've wanted to see what tribal knowledge I could learn from a more experience sewist. I've also been a reader over at Stitched in Color for a little over a year. I was recommended to her by another quilter and instantly fell in love with her rainbows and hand stitching and fresh aesthetic. 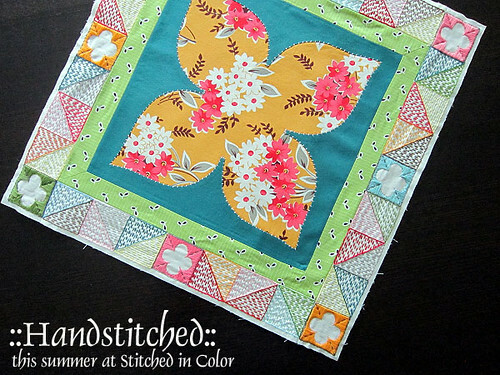 And now, these two data points have merged and produced something sublime...Rachel is teaching her second online class, Handstitched, which covers reverse applique, embroidery, English paper piecing, applique, and (you guessed it) hand quilting. I couldn't sign up fast enough. Which means my June, July, and August shall be filled with small stitches, luscious color, and (hopefully) more than a few finished projects. I'm hoping the class format will provide enough motivation to keep me on track, but, just in case, I signed up for the Premium version which means I will get an e-book of all the projects at the end of the class. You know, in case I still need to finish something or want to make it again. I am especially excited about the sampler quilt which will showcase each of these skills. The paralyzing part? PICKING COLORS. Eeep. I figure I'll just take it one bit at a time. If I can decide a rough color scheme, that'll be enough to keep me going. I'm thinking I may go with turquoise/sea green/grays/with a bit of orange. I bought small cuts of lots of those colors in order to make some wall hangings for our bedroom, but I will have PLENTY of fabric left to do other things with. Plus, I know several people who like those colors, so if it doesn't stay with us, I can find it a good home. If you are interested in joining in, head to this post for more details. There is a $10 discount on registration through the 16th!